Exit Realty of Lubbock is an organization of professional real estate agents and brokers that pride themselves on treating each client with integrity. We consider ourselves a family and would love the opportunity to serve your family by helping you invest in real estate in the Lubbock market. 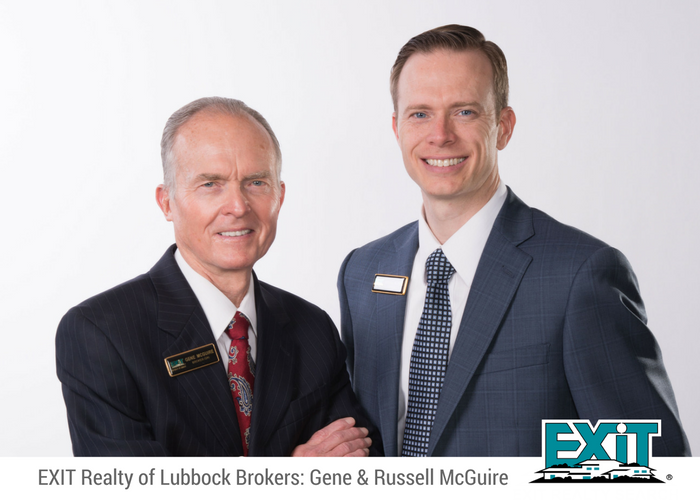 Gene and Russell McGuire opened Exit Realty of Lubbock in 2007 with a total of four agents. Since that time we have grown to over 100 agents and have moved into a newly constructed office on the West Loop of Lubbock. Our goal is to serve each client with the utmost honesty and integrity. Real estate is a service business and we work hard to give every client exceptional service. We have been blessed with success in the Lubbock market. For the past eight years we have received recognition for our residential listings having the lowest days on market among the top ten companies in Lubbock. EXIT Realty of Lubbock is consistently rated the best performing EXIT brokerage in the Northern region of Texas. EXIT Realty of Lubbock is one of the fastest growing brokerages in Lubbock mainly due to the satisfaction of our clients. Lubbock is a wonderful place to call home and Exit Realty is thankful to have helped so many families find their next home. Gene and Russell McGuire are the father/son team that serve as the Broker/Owners for our company. Gene and Russell have grown the EXIT office through hard work, integrity, and a sincere belief in building an environment that promotes the success of our agents and the satisfaction of our real estate clients. This hard work has not gone unnoticed as they are respected and acknowledged for their success by their peers. Gene and Russell were honored by Exit Realty International in 2015 as the Brokers of the year.